Our 2011 Road Trip #11: Seeing Hamilton for Free « Midlife Crisis Crossover! 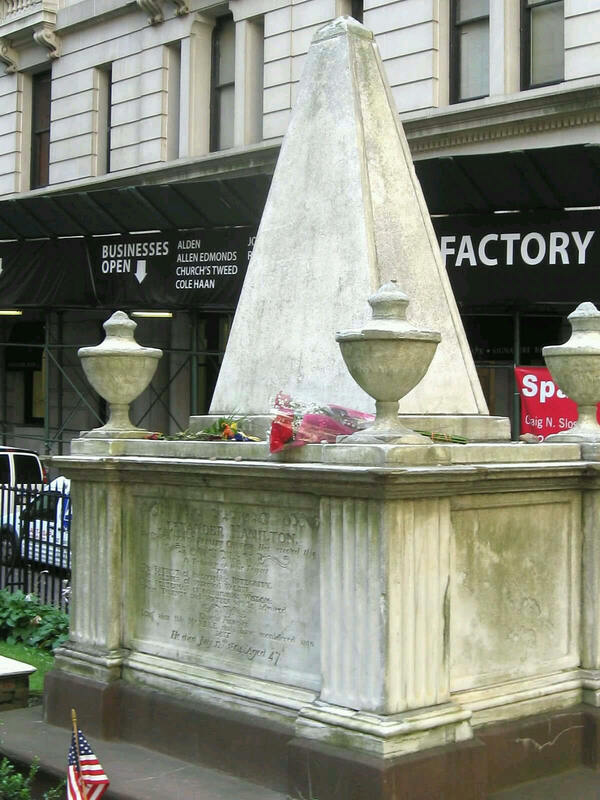 You, too, can see Alexander Hamilton in Manhattan without tickets. Hey, kids! It’s Hamilton! And some other special guests from previous centuries. DAY FOUR — Tuesday, July 12, 2011. We awoke to the local morning news breaking a story about twelve people shot, two of them fatally, in some incident in Newark. Our reaction: dull surprise. My idea for breakfast was Cafe Metro, a food stand at the Port Authority with an amazing wide selection of pastries and sandwiches. They cater to commuters and therefore had no seating for those of us trying to spend our morning outside the fast lane. Rat-race contestants nearly trampled us when we tried to cross midstream and approach the counter. They nearly trampled us again once we tried to step away. It took us several attempts to merge with oncoming foot traffic. Rather than search in vain for benches or tables, we carried our grub outside and ate hobo-style at the foot of the Ralph Kramden statue. I think I was the only one happy with the meal arrangement. From there we walked downstairs to the basement (or maybe the sub-basement, or perhaps their secret third floor) and took the E train south to the world-famous former location of the World Trade Center severe construction area. 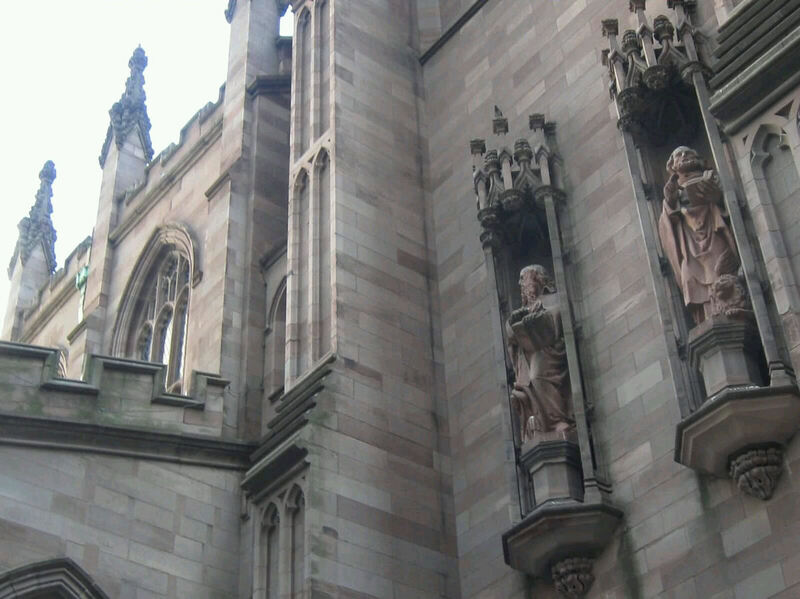 Our first tour of the day was at nearby Trinity Church, which has its own claims to fame. Details along the outer wall. For some reason neither of us took an establishing shot of the entire church itself. 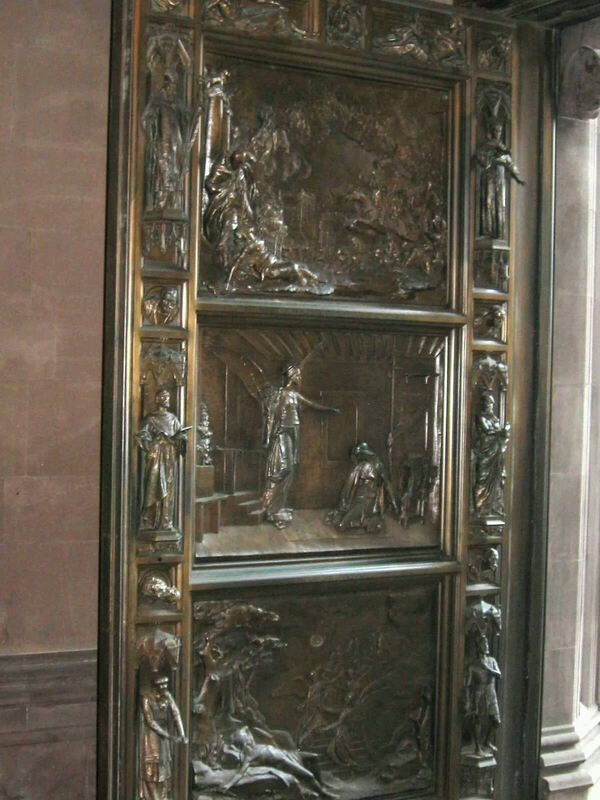 Trinity Church’s amazing, intricate doors welcome visitors with immediate artistic class and depictions of famous Bible scenes. Anne can identify the specific stories, chapters, and verses better than I can. 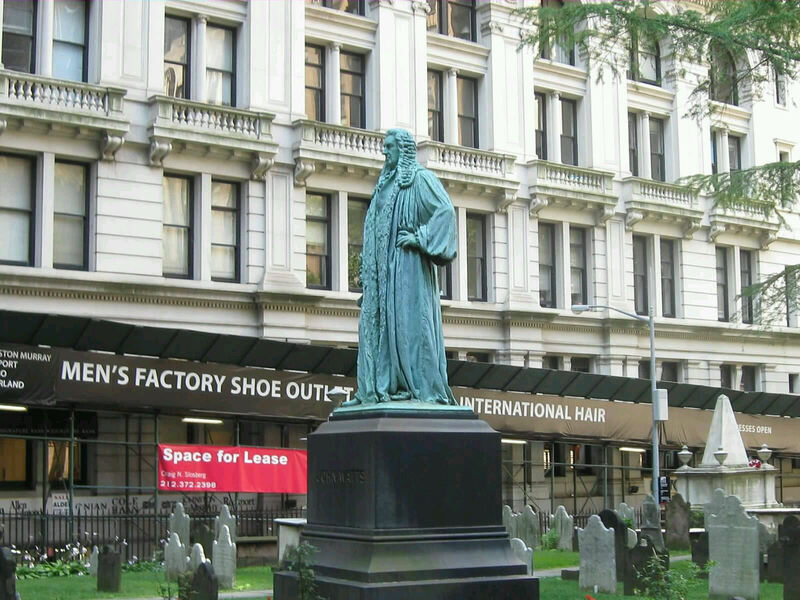 This certificate of authenticity confirms that this Trinity Church is the Trinity Church you’re looking for. 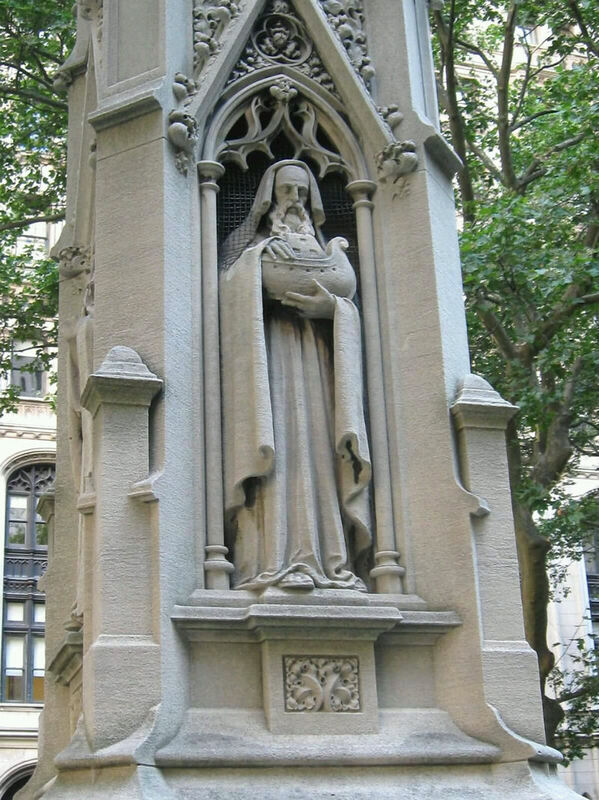 There’s another Trinity Church on Manhattan’s opposite end, but its cemetery residents aren’t as high-profile, unless you’re a big fan of John Jacob Astor. Hope that helps any furriers in our audience. Entire volumes of history summed up in a single stone rectangle. 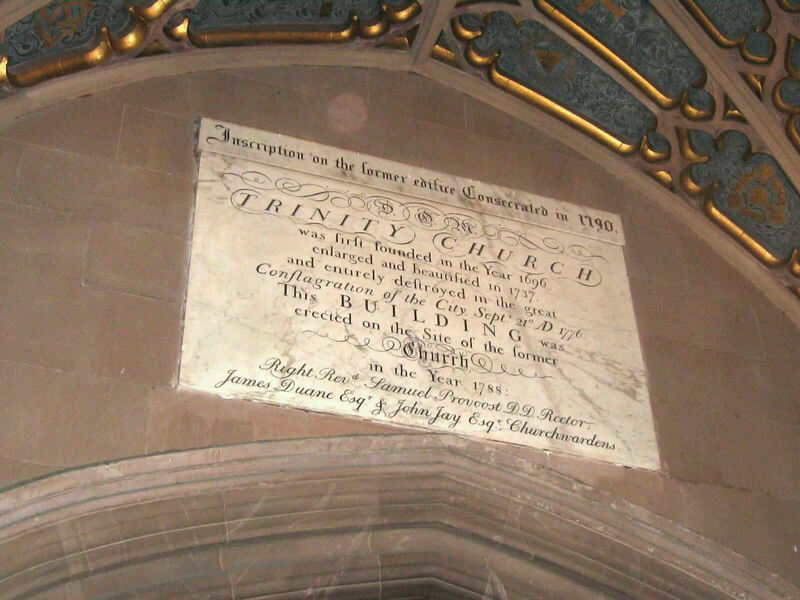 Trinity Church was once walked into by the Queen Herself. Believe it or not! Her consort Prince Philip has to settle for occupying one corner of her plaque — no separate marker or even a pet rock to call his own. We headed inside and skimmed their various brochures in search of a cemetery guide or map. The vaulted ceiling and amazing acoustics made themselves known when my son noticed a peculiar stand to one side and announced, “Look! Hand sanitizer!” and we all cowered as the sound of “-IZER! -IZER! -IZER! -IZER! 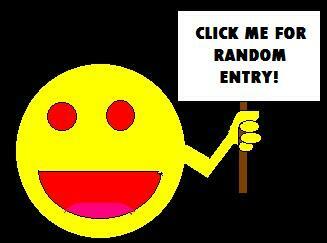 -IZER!” reverberated throughout the halls as if shouted from a mountaintop. A helpful minister gave us the necessary informational tools to guide us around. Hopefully she didn’t curse us as we retreated outside. 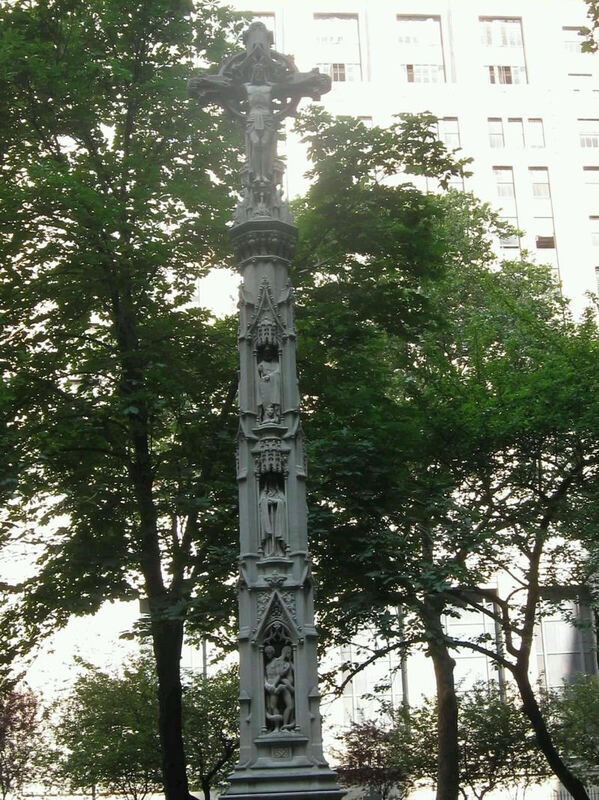 Among the first sight was their Soldiers Monument, one of the largest fixtures on display. Anne loiters at lower left for size reference. 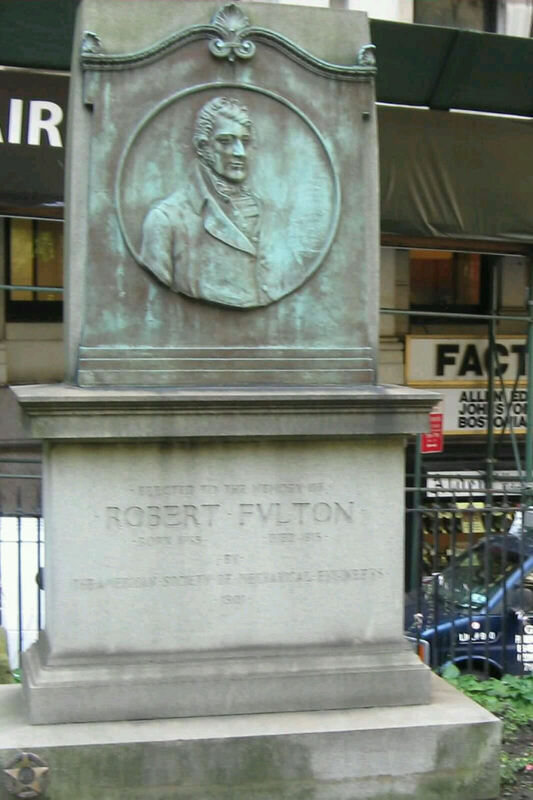 The tombstone of Robert Fulton, inventor of the steamboat and other mass transit options. Fulton was a pioneer in the development of torpedoes, but for some reason children’s book reports always give top billing to the steamboat. Maybe if torpedoes were cuter they’d receive their due. 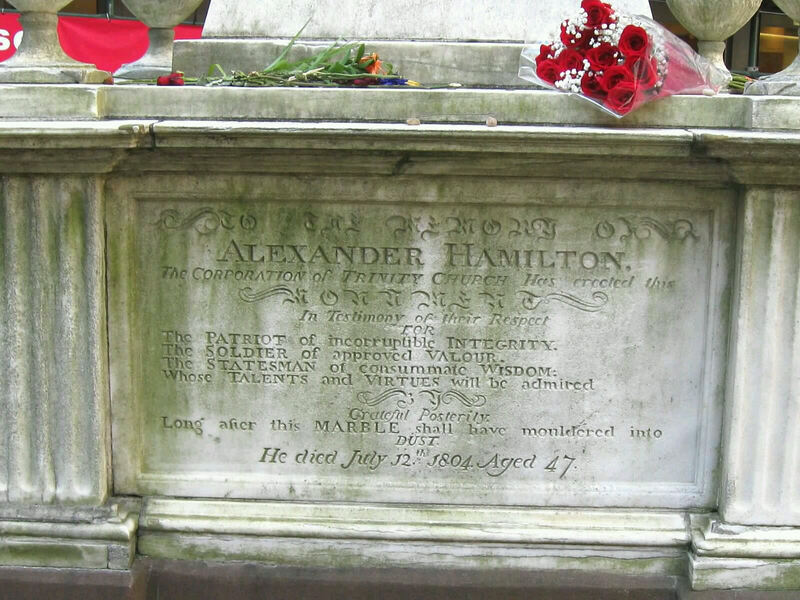 Their star resident, the one and only Alexander Hamilton, headliner of the American ten-dollar bill, and who also spent his lifetime doing money-related stuff and things. Surprise synchronicity: our visiting day of July 12th just so happened to be the anniversary of his murder. Strange but true. Meanwhile, Aaron Burr is buried a safe distance away in Princeton, NJ. The grave of Congressman John Watts, about whom we knew nothing except that a lot of rock was carved in his memory. Maybe he was kind of a big deal to his coworkers. 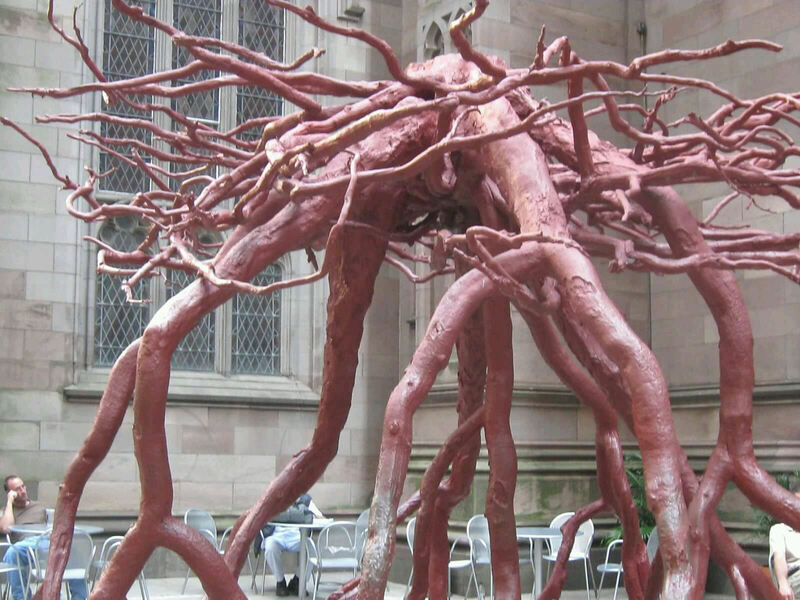 This massive sculpture next to the church was inspired by the roots of a sycamore that fell within the vicinity on 9/11. At first we thought they simply slapped several coats of shellac on the original roots, but no. Bored guy lingers at lower left for size reference. This honorary Christian totem pole impressed me, but I didn’t take a single note to go with it. 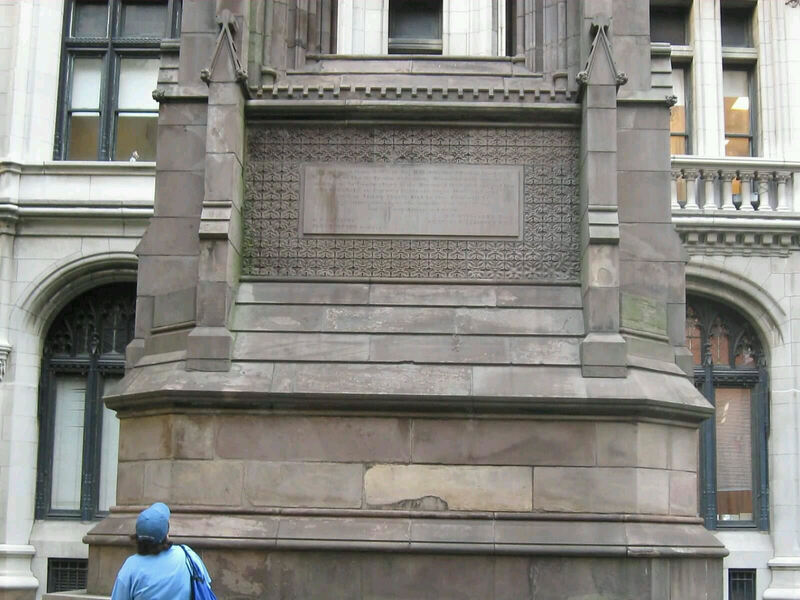 One of several sculptures unrelated to any specific departed. 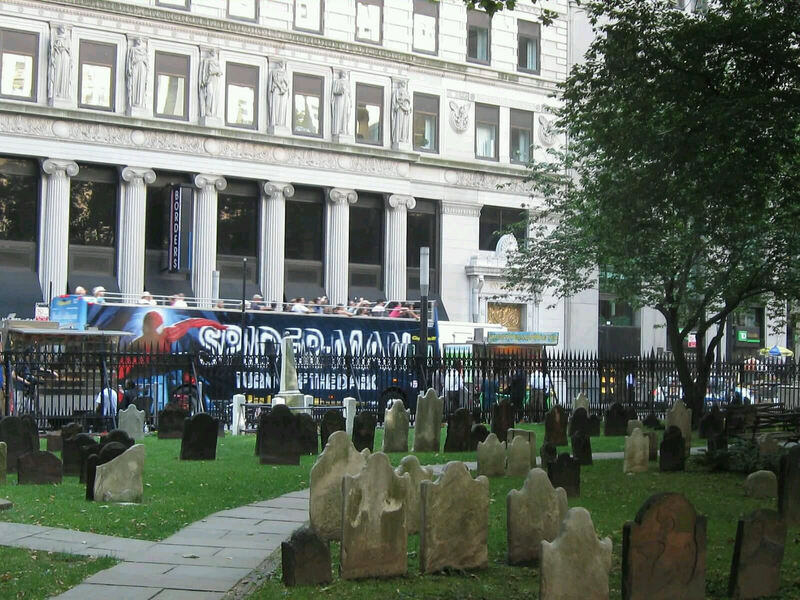 A true trinity of the dead: rows of ordinary headstones, an abandoned Borders across the street, and another harbinger for the Broadway doom of Spider-Man: Turn Off the Dark. 1. 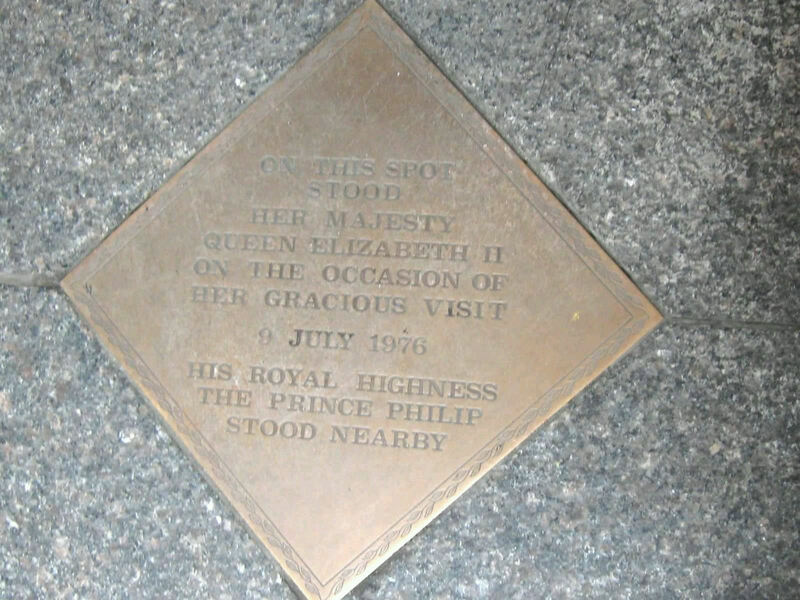 The Queen Elizabeth II Stood Here Stone celebrates its fortieth anniversary as of this writing, give or take some weeks. Pingback: Our 2011 Road Trip #26: Hamilton’s Final Show | Midlife Crisis Crossover!